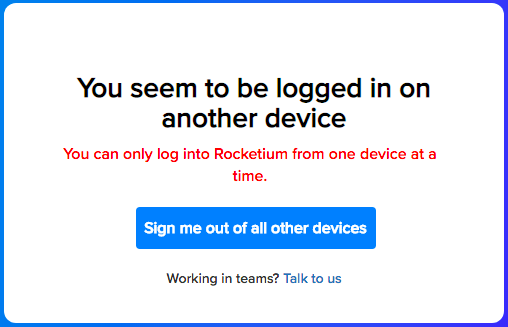 When you access the Rocketium Editor in multiple devices (or in multiple tabs/windows in the same device) there is a high probability that your changes will not be saved. In order to prevent data loss (seeing all your hard work not saved can be very frustrating! ), we enforce our users to login from one device at a time. In case you see the message below, it is possible you have logged in from more than one device. You could choose the option 'Sign me out of all other devices'. "But my team members use my account to login. How can I let them access the videos I made?" If you work in teams, and you wish to share your work with them, you can sign up for our Agency Plan, which is custom made for video creation teams. In the Team/Business plan, you can create teams, invite team members, collaborate together, comment on videos, and get your videos reviewed before you publish them.